Home > 2014 > December > GCC News from Peru! We are excited to bring you news from Lima, Peru where members of the Global Climate Convergence, including Jill Stein and Roshan Bliss are on the road with the Alliance for Global Justice climate delegation – an inspired group of social justice, peace, labor, racial justice and youth organizers. The delegation is in Peru to join with thousands of others from across the world in protest of the corporate-controlled U.N. climate negotiation process called the Conference of Parties (COP). We decided to join this delegation because we know that instead of looking to the COP for answers, we must build democratic solutions to the climate crisis ourselves. 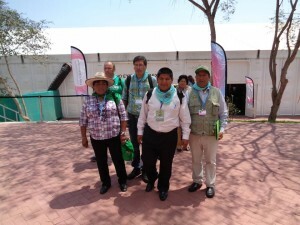 Delegation members spent their first day in Lima with their hosts, the Peruvian based Citizen’s Movement to Confront Climate Change (MOCICC). The MOCICC is also the community organization sponsoring the People’s Summit taking place in parallel to the COP meeting. In Lima MOCICC gave a two-hour talk about the background of the climate struggle in Peru and highlighted the power of numerous social movements coming together to fight neoliberalism, imperialism and extractivism. Their holistic approach to organizing is another sign that all over the world people recognize that the climate crisis will only be solved by confronting the power behind it. Next, the delegation visited Cajamarca – the proposed site for the world’s largest gold mine and what many consider the center of environmental resistance in Peru. 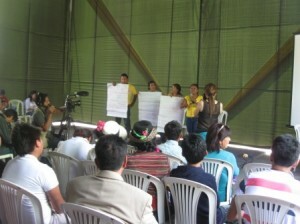 The environmental movement in Cajamarca has become a growing political movement as well, and is led by the dynamic Movimiento de Affirmacion Social. In Cajamarca the delegation met with regional vice president Olmedo Auris as well as the teachers’ union, student union, and popular defense committees. The region’s government is now controlled by environmental supporters, but they face continued resistance to their activism from the pro-corporate national government. Case in point – the movement-aligned regional president Gregorio Santos was recently elected from jail where he resides as a political prisoner. During their trip Jill, Roshan, and other GCC aligned organizers have been sharing the idea of a People’s Climate Strike for December 2015 during the final, binding COP meeting that will take place in Paris. The response from Latin American groups has been extremely positive, and the MOCICC even offered to help distribute flyers about the upcoming Mother Earth Day / May Day Mobilization and People’s Climate Strike at the People’s Summit. The delegation will be in Peru until the conclusion of the People’s Summit on December 12. We are deeply inspired and encouraged by the connections and friendships made there so far, and are excited about learning from our many new international partners as we move forward in the struggle for a just and democratic climate future. 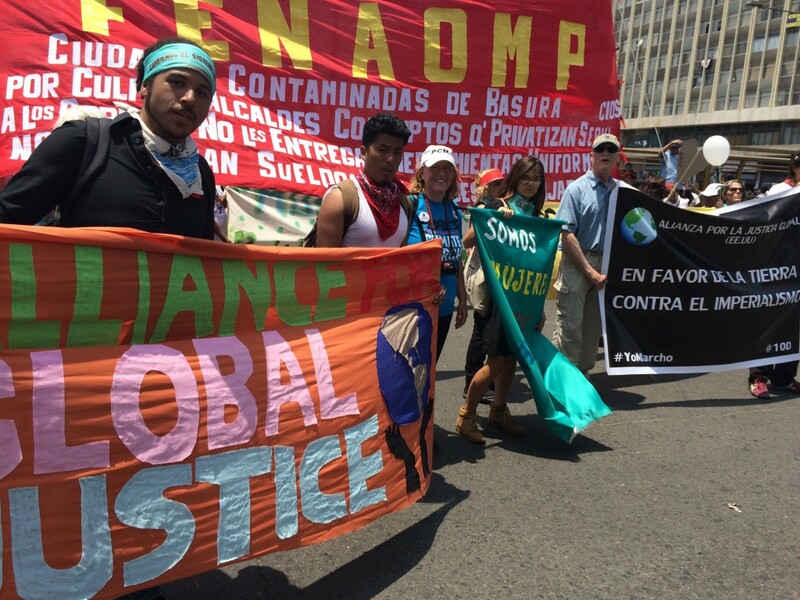 We are happy to report that Global Climate Convergence organizers Jill Stein and Roshan Bliss have just returned from Lima, Peru where they took part in the Alliance for Global Justice’s climate delegation as well as the locally organized People’s Summit. Both events were organized to protest the ineffectiveness of the U.N. climate meeting (known as the COP 20) taking place in Lima. They were also designed to provide international forums to discuss the people-powered and democracy based solutions we need to the truly solve the climate emergency. 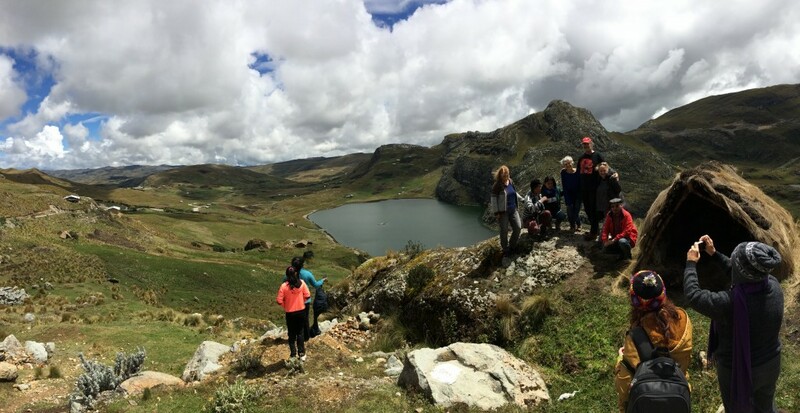 During their travels, the AFGJ delegation visited the Mamacocha Lagoon in the Lake Country ofCajamarca, Peru and connected with Ronderos – campesinos who guard the Lagoon in order to protect it from the mining company draining it as a part of their Conga mine expansion plans. The Ronderos utilize small huts to courageously guard the Lagoon every single day, around the clock. The first photo below shows the delegation standing next to a Rondero hut overlooking the Mamacocha Lagoon. The second photo shows the delegation with the Ronderos, who came out of their fields to meet with the delegation (the five men towards the center of the photo wearing baseball caps). At far right is James Jordan from the AFGJ (the organization sponsoring the delegation and GCC partner) and next to him is the GCC’s Jill Stein. Roshan Bliss can be found near the photo’s center. 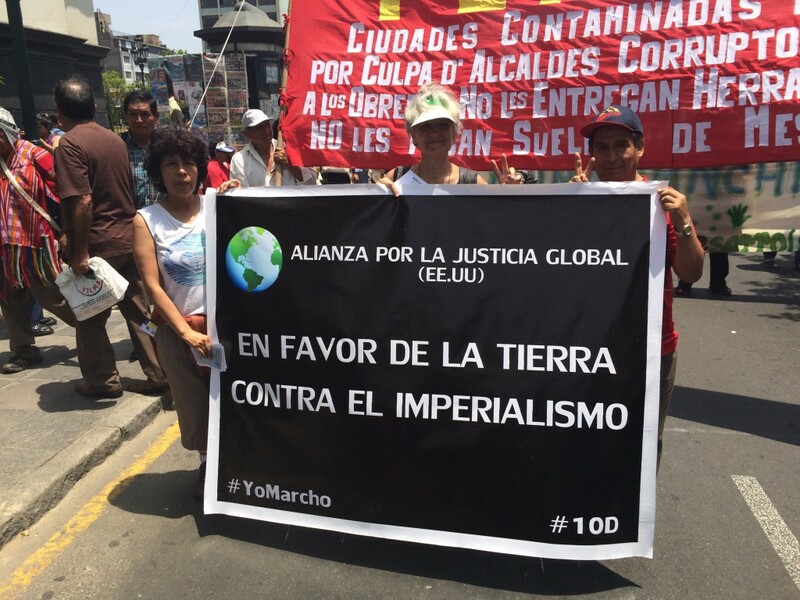 The delegation took part in the March en Defense de la Madre Tierra (March in Defense of Mother Earth) on December 10 in Lima, Peru. The march was designed to emulate the People’s Climate March in New York and is reported to have drawn 15,000 participants into the streets demanding real solutions to climate change including an end to the extraction of fossil fuels, the large-scale development of renewable energy, and environmental policies that prioritize people and planet over profits. Check out an article outlining the Declaración de Lima – the demands the Summit delivered to the President of the COP 20 and Peruvian Environmental Minister Manuel Pulgar Vidal. The document calls out the COP 20 for the outsized influence the industrialized countries and trans-national corporations largely responsible for climate change have over the treaty making process. The youth movement in Latin America mobilized in force at the People’s Summit to diagnose and explore how social justice, environmental protection, and democracy organizing are all inter-related. Youth organizers also proposed many climate policy solutions including alternatives to traditional models of economic development and the wholesale inclusion of youth and front-line communities in the decision-making that will affect their futures.